It’s officially the Month of Love. Chocolate=love in my home. 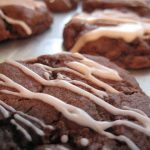 I found this recipe a few years back when I subscribed to Food Network’s 12 days of Cookies (Christmas time tradition). They send a new cookie recipe for 12 days in a row in November. In the 3 or 4 years I have subscribed, this is the only keeper recipe. Choc Peppermint Cookies are a little like a brownie/cookie. I’m not a big mint lover, so I go easy on the mint extract. You could always leave the mint flavoring out too. During the holidays we added the sprinkles to make them a little more festive. A bunch of these in a really cute box from a craft store with pretty pink or red ribbon would make a great inexpensive treat for your Valentine! Preheat oven to 350 degrees F. I use the convection bake setting. If you are not using convection, you may have to bake these for a total of about 10-12 minutes or until barely set*. In a medium bowl sift together flour, cocoa powder, baking soda and salt. Set aside. In a mixer beat together the butter with the sugars until fluffy, about 2 minutes. Add eggs 1 at a time, beating until smooth after each addition and scraping the sides of the bowl as necessary. Add vanilla. On a low speed beat in the flour mixture a little at a time. Gently mix in chocolate chips. On an ungreased cookie sheet, drop teaspoons of the batter about 2 inches apart. Bake until just cracked on top, about 8 minutes, rotating the pan halfway through the cooking time. Flatten the cookies slightly with a spatula after removing from oven. Cool completely. In a small bowl mix together the sugar; mint extract and cream until smooth. Transfer mixture to a medium resealable plastic bag and snip off a tiny bit of the corner. Drizzle glaze over cooled cookies. Let cookies stand until set, about 10-20 minutes. If desired, before glaze sets, sprinkle with chopped mint candy. -I add the dry ingredients all at once, with the chocolate chips. 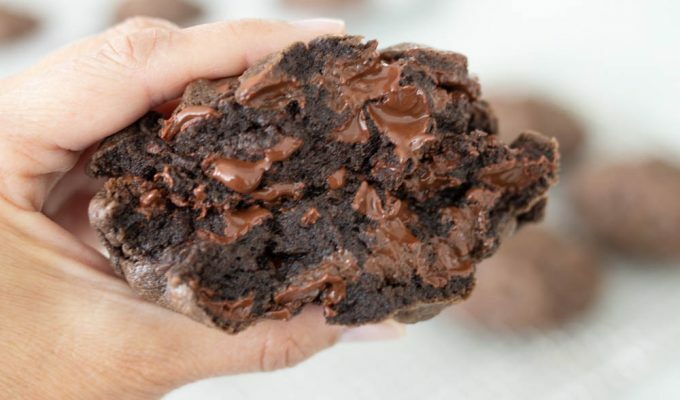 I do this on all chocolate chip cookies, it helps keep the chocolate from sinking to the bottom of the cookie.-*Do not over bake. Let the cookies cool completely before glazing. They will continue to cook and set up a bit after removing from the oven. I just made these last friday. They are one of my new favorite cookies. I love mint, so I go overboard on the mint flavoring! oh my my. You know mint and I are BFFs. happy days. ps, of course this is Erin, not Ali. Cute pic Mel. I made these over conference weekend while the boys were gone. They were so delicious. I love how dense, thick, chewy and brownie like they were. I’m posting them later this week. I referenced your blog in my post of course! These cookies are probably the best cookies i've ever tasted! i made them last year for christmas and everyone loved them! i'm making them again this week and i can't wait! 🙂 they are so delicious! Hi Natalie. I just noticed the recipe somehow was deleted in the conversion last year! I just updated it. Give this recipe a try I know you’ll love it!